With Batchsync subscription you benefit from all new development and features: You can any time update your Batchsync software to the latest release. Find the current version number you are running in the About window. The upgrade process is simple: Download and install new version over existing one. All upgrade steps are done automatically. We ran similar 90-day test on Microsoft Azure, running Batchsync V12 on Windows Server 2019. Results are also similar, 100% successful. NEW Batchsync V12 is fully compatible with Windows Server 2019 running on premises, and on Microsoft Azure. IMPROVED On local to local transfers, Batchsync removes read-only attribute on target file (if read-only attribute is set), to allow copying to overwrite file. IMPROVED Flat UI design on all software windows and dialogs. Consistent look on all various Windows versions. NEW Local to local syncs. After numerous requests by customers, we have added possibility to automate file transfers between local and network share folders, portable drives, USB memory sticks, NAS storage, and linux SMB shares. So now you can set up local backups, syncs, copies and moves on your local network, using the same extremely reliable transfer engine, that has powered Batchsync remote file movement since day one. NEW Local to local syncs have all the same filtering, email notification and scheduling features as remote transfer tasks. NEW You can access local to local transfers in updated Task Wizard, and Edit Task windows. IMPROVED We originally designed Batchsync V12 for Full HD (1920x1080) resolution or higher. Now we have learned that lower resolution screens are still surprisingly widely used among our customers, and therefore have redesigned software to work better also on those older screens. IMPROVED UI improvements in Edit Task, Edit Server, Select Remote Folder, and Edit Options windows. IMPROVED UI improvements in the Main window. Fixed: Very rare problem, where in two-way sync w/ propagated deletions, if file was downloaded successfully, but local timestamp setting failed after multiple retries because OS kept file locked, remote file was not properly downloaded again. Thanks Mike (UK) for letting us know about this issue. Fixed: On some non-english systems, Running now - list did not properly show running tasks and tasks list didn't update next/previous scheduled run times, even tasks were run on proper schedule successfully. NEW Select remote folder-window in Edit Task, making remote source/target folder selection easier. Also used for selecting archive-folder for the task. Fixed: Archive after transfer failed on some systems, when source and archive folder were on different volumes. Thanks Tim (USA) for helping us solving this issue. Fixed: When manually adding multiple triggers for task in Task Scheduler, show "Multiple schedules" and Previous & Next run times in main window task list. Thanks Jacob (Danmark) for helping us solving this issue. Fixed: When updating to new release (=install it on top of old version), keeps all global settings intact. Fixed: Incorrect screen element colors on some Windows Server 2008 & R2 installations. Fixed: Scheduling failed on some systems with "Task not started" status. Fixed: Scheduling failed on some systems running on non-English Windows locale settings. Is now language and locale independent. Thanks Michele (Italy) for helping us solving this issue. Fixed: Scheduling failed if username had spaces in it. IMPROVED Edit task window UI changes. NEW New company name Maxlevel Inc and maxlevel.com web site. We say goodbye to our 20-year old company name Sitedesigner Technologies Inc. and sitedesigner.com web site. Our new company name Maxlevel Inc, tells everything about us and Batchsync: You get maximum performance and reliability in automated file transfers. Non-stop. NEW New dashboard. Dashboard shows you statistics about your daily transfers, like number of tasks run, number of files transferred and total data moved. You can browse stats for each day by clicking arrows next to the calendar display. NEW New Now running-view. Real-time view of currently running tasks. NEW Switch between task- and dashboard-view with buttons on the top left of command bar. NEW Robot mileage. Top of the main window shows you all time statistics of robot file transfers since its installation. V4 and V2 - subscriptions are now available only with volume licensing. IMPROVED About window is combined with startup window. New startup window look with more information about subscription. NEW New task list on the main window, that combines task data with scheduling info. Displays current status of the task with Running/Ready, previous run time and next run time. Removed icons for tasks in Edit task-window, that are no longer needed with new task list. NEW Schedule task manually - feature added to Task Edit window. IMPROVED Improvements and fixes in the help file. IMPROVED UI changes to Task Edit-window. Fixed: Bug: Windows login username and password were not properly encrypted when stored to the task file. Now they are stored with 256-bit AES encrypted. IMPROVED Improved handling of multi-threaded transfers, increased stack space for each thread. NEW Batchsync V12 is released. Batchsync V12 is the most important upgrade since our software was first time released 12 years ago, in 2006. We have combined all previous Batchsync and InstantSync versions into a one: the best automated file transfer software available anywhere, for any operating system, and for any price. As Batchsync runs unattended 24/365, non-stop, we call it Managed File Transfer Robot. 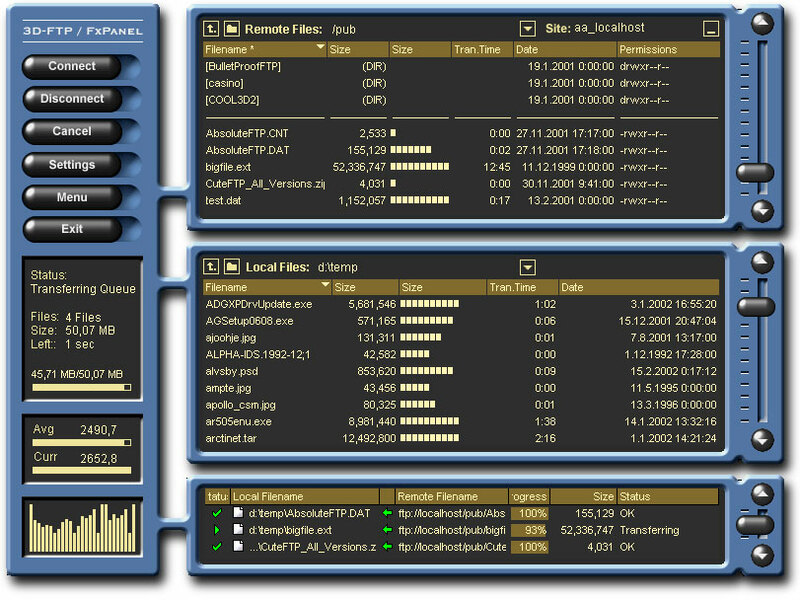 3D-FTP was one of the first multi-threaded FTP clients available. It supported skins, a very popular UI concept of its time, and provided extremely fast file transfers. The MultiWire transfer engine of 3D-FTP later evolved into a one that we used for Batchsync when it was released in 2006. And today, almost 20 years since its first release, and many generations later, the same MultiWire transfer engine still powers Batchsync V12. Refined by hundreds of releases, thousands fixes and improvements, it has evolved into a rock-solid file transfer component. Transferring billions files every month. 24/365. Non-stop. © 2019 Maxlevel, Inc. All rights reserved.